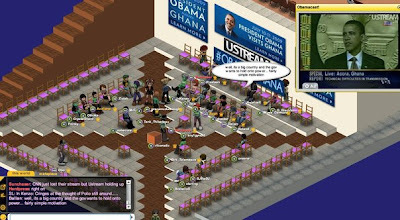 As CBS news reported in "The Obama White House's First Try At Second Life," the U.S. president, who is visiting Ghana, spoke to live audiences in the virtual worlds of Second Life and Metaplace. Unlike his visits to Second Life as a candidate, however, according to the news agency, he will not be embodied as a 3-D computer generated avatar. "...however, he will not be embodied as a 3-D computer generated avatar."